If you’ve tried to snag a seat at Little Gull’s oyster bar on a busy night or at The Walrus & The Carpenter pretty much any time, you’ve likely noted the phenomenon. Lately, we just can’t get enough of plump and briny oysters—we revel in the taste of the Northwest that’s captured in each freshly shucked bivalve. But the opening of new oyster bars and a growing appreciation for the sense of place that oysters represent are fueling an appetite that may be at odds with the realities of oyster farming. “I wouldn’t say it’s a renaissance exactly, but a new evolution,” says Bill Taylor, who has a keen perspective on local oyster industry as part of the fourth generation running Taylor Shellfish Farms, based in Puget Sound. His take on the current hot-ticket status of oysters is, at least in part, that people increasingly want not just good food when they eat out, but unique experiences. “The ability to taste and compare oysters from different regions, the variety of options to choose from—it’s a great way to get people excited about oysters,” Taylor says. Indeed, we are blessed with easy access to a mind-boggling selection that makes a quick trip from beach to bar—no boarding pass required: Blue Pool oysters from Hama Hama, with a crisp texture and distinct vegetal finish; Sister Points from south Hood Canal, with a taste of fresh seawater and slight cucumber; Judd Cove oysters from Orcas Island, with a light brininess and mild flavor that are easy to love; and many dozens of others. “We’re as spoiled as anyone can be, with the best farms right here,” says Renee Erickson, co-owner of Ballard’s wildly popular aforementioned Walrus (called “the prototype for the modern oyster bar” in The Wall Street Journal, no less). Indeed, there aren’t many oyster bar menus in the country that don’t offer at least one type of oyster plucked from nearby waters. And oyster fanatics from far away regularly make pilgrimages to shuck and slurp our amazing oysters on their home turf. But challenges both old and new have made raising oysters a more demanding prospect. Water quality problems, habitat issues and acidification are among the culprits, the last factor causing the most consternation right now. Carbon emissions don’t only float skyward toward the atmosphere; they also are absorbed into the planet’s waters. Increased carbon in the water raises the level of the water’s acidity, which impedes the oyster’s ability to form a viable shell, a process that begins within hours of hatching. Without that initial shell, the oyster’s chances of survival dissolve. Although some oyster farms, such as the Hama Hama Company, may raise at least some of their oysters from wild spawn, most oysters from local farms grow from seed formed in a hatchery—such as Taylor Shellfish Farms. “Hatcheries have the luxury of being able to change conditions [of the sea water in land-based tanks] to where they need to be to allow the oyster seed to set and form that initial shell,” notes Margaret Pilaro Barrette, executive director of the Pacific Coast Shellfish Growers Association (PCSGA), based in Olympia. If a new oyster formed in a controlled environment has a good shell in its first few days, it has likely cleared the acidification hurdle once it is released into area oyster beds. But what does moving an oyster from one place to another do to its character? “I can say with complete confidence that the water conditions of hatcheries have no influence on an adult oyster’s flavor,” says Lissa James Monberg of the Hama Hama Company, who, along with her brother Adam, is the third generation of her family to tend oysters on Hood Canal. “We can take oysters from the hatchery, from the same seed cohort, and grow them in two different locations, and they’ll have very different flavors.” That’s the “merroir” (the aquatic version of terroir) factor at its best: the variations in feed, temperature, water depth, habitat and other natural influences that give oysters from one bay a taste distinct from those just an inlet or two away. Bill Taylor is pragmatic. “We aren’t going to stop carbon emissions,” he notes, “we’re going to have to adapt or become a dinosaur…” For Taylor and other hatcheries that raise their own oysters as well as sell seed to other growers, adapting to today’s conditions includes careful study of their operations and managing hatchery water chemistry to give oyster hatchlings every opportunity to build that initial shell. They employ pH monitors to test incoming water, which has natural fluctuations in pH based on time of day, time of year and wind conditions, to, in turn, regulate when they draw in water. Operations such as Taylor and Nisbet Oyster Co. on Willapa Bay also have operations in Hawaii, where acidification impact is negligible. These factors come at a price, and it may mean our half-shell indulgences become more expensive over time. From the hatchery, some growers, such as Hama Hama, transfer the seed to an intermediary nursery within the natural growing environment, in or very near the water, which accomplishes a couple of things. The growers can buy smaller seed at a lower price, keeping their own costs down and allowing hatcheries to produce a higher volume of seed. The nursery time provides the tiny oysters with a stable environment, offering minimal tidal influence and safety from predators during their most vulnerable stage. Seed oysters, from whatever source, are set out in one of a farm’s oyster beds—a plot of beach approved for shellfish growing by the state and permitted to growers for that use—to mature. This is one of the most minimally controlled forms of aquaculture; nature itself takes care of much of the rearing. There’s no feed added, no drugs used, and, in fact, oysters are a vital contributor to the region’s habitat as voracious filter feeders that benefit local water supplies. Many local entities are focused on the habitat that these luscious shellfish call home. In addition to the PCSGA are the National Oceanic and Atmospheric Administration, the Washington Marine Resources Advisory Council, the Puget Sound Restoration Fund, tribal authorities, Puget Soundkeeper Alliance and the Puget Sound Partnership, among others. 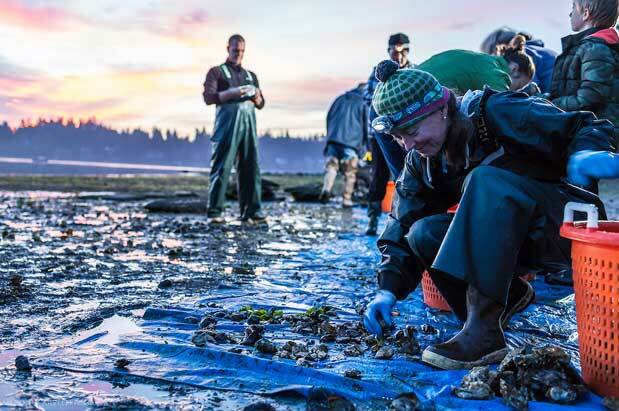 Some are working together under the auspices of the Washington Shellfish Initiative, which was unveiled by Governor Christine Gregoire in 2011. Governor Jay Inslee, for whom climate issues are a priority, continues the momentum, having assigned one of his policy advisers to focus on shellfish issues. Efforts include assessing and managing land-based sources of water pollution, researching types of seaweed that might absorb excess CO2 and further refining breeding programs to manage healthy oyster development in the changing water environment. Supplying food lovers with amazing oysters isn’t the raison d’être of these agencies. But the fact that oysters are such a vivid representation of the health of our region’s saltwater ecosystem makes them an important litmus test for conservation efforts. If the outcome of those efforts means also preserving the pleasure of oyster slurping, that’s a delicious bonus. A new sibling to accompany the reincarnation of Lark includes a centerpiece raw bar. At press time, due to have opened in November. Capitol Hill; 952 E Seneca St. Among the trailblazers of half-shell indulgence in Seattle, open since 1979.